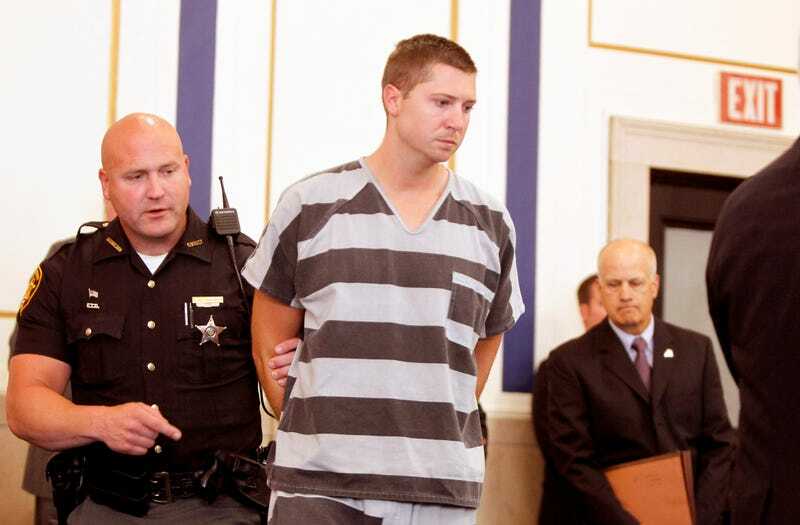 Former University of Cincinnati Police Officer Ray Tensing enters Hamilton County Common Pleas Court to be arraigned on murder charges July 30, 2014, in Cincinnati. The mistrial of former University of Cincinnati Police Officer Ray Tensing in the shooting death of Sam Dubose is the latest reminder that in the eyes of many, black lives don’t matter. On Saturday, Judge Megan Shanahan declared a mistrial after a jury of six white men, four white women and two black women failed to reach an agreement as to whether Tensing had been proved guilty beyond a reasonable doubt on the charges of murder and voluntary manslaughter. As a former prosecutor, I’m simply at my wit’s end. I have pondered in this space what it will take to convict police for the criminal use of excessive force, and the reality is, we simply cannot beat race. It doesn’t matter that there was a video. It doesn’t matter that Dubose was unarmed. It doesn’t even matter that on the day of the shooting, Tensing was wearing a T-shirt bearing the Confederate flag under his uniform. So, what do we do? How many times do we have to relive this horror movie while becoming so familiar with the plot that the result is that we become more desensitized to its unjust ending? We cannot allow the continued killings in, and abuse of force against, communities of color by law enforcement to become normalized—especially while at the precipice of an era when over-policing threatens to become more of a thing under a self-described “law and order” president-elect. I’ve said it before, I will say it again: We have to show up to jury duty. There is always a respectable movement in our community during election seasons around voting, but while this is both admirable and necessary, civic engagement extends far beyond what we do at the polls. Sadly, justice is not our default position, although that technically should be our right as Americans. This means that we have to remain as vigilant as possible to “force justice” at every turn through accountability. Voting is one of the most direct means of holding folks in power accountable, but jury duty is one that too many sleep on too often. When we look at most of the high-profile cases, which we have seen too often, undesirable outcomes can be linked to a lack of black faces on the jury. You never know when you dodge jury duty whether you may have given away the chance to help force justice by holding folks accountable. 2. We need independent prosecutors. It’s important to understand that this is a cumulative approach. Once we are properly engaged, we can more effectively push for police reform and policy mandates that will help serve our community. One of the most important policy mandates that we can push for is bringing in independent prosecutors on police-misconduct and excessive-force cases. Law enforcement encompasses both the police who make arrests and the prosecutors responsible for securing convictions through the court system. In plain speak, these are folks who are on the same team. It is unrealistic to expect that the same prosecutors who rely on these cops for trials, witnesses and evidence will then put their best foot forward in ensuring that they prosecute with full zeal in those instances when those officers are under fire. Some progressive states, like New York, have gotten in front of this. But that only occurred once elected officials understood the political expediency of it. Forcing justice means that we must make clear through our engagement and our demands that this is not simply a point of expediency but a nonnegotiable imperative. 3. Our civil rights statutes need revision. Many of the police-misconduct provisions of our federal civil rights statutes are over 20 years old. Now more than ever, we need amendments to allow for an easier path for civil suits and private right of action to enforce the statutes we have on the books. In addition, there is pending legislation, like the End Racial Profiling Act, that has been introduced and consistently promoted chiefly by Rep. John Conyers (D-Mich.). ERPA builds on guidance issued by the Department of Justice and bans federal law-enforcement officials from engaging in racial profiling. The bill would apply this prohibition to state and local law enforcement, close the loopholes to its application, include a mechanism to enforce the new policy, require data collection to monitor government progress toward eliminating profiling, and provide best-practice incentive grants to state and local law-enforcement agencies to enable them to use federal funds to bring their departments into compliance. But these policy mandates won’t happen or work if we don’t stay engaged and place clear demands on those whom we elect to represent our interests. The case of Ray Tensing is another example of how big our challenge is when it comes to race and criminal justice. Even as it seems insurmountable, we continue to look for creative ways to force justice in a system not meant to protect us. These steps will not fix everything; nothing will do more than a paradigm shift in how we navigate criminal justice. But if we stay engaged, it’s possible that these are a few small steps that can help us get that much closer to a conviction.